Tarte tatin always looks fabulous on the dinner table. It is one of those desserts that can end up with a really professional looking appearance, almost like something you’d see in a Parisian patisserie window.These recipes are for a couple of sugar free versions. We’ve opted for the traditional apple tarte tatin and then to go for a slightly different take on it with a pear version. 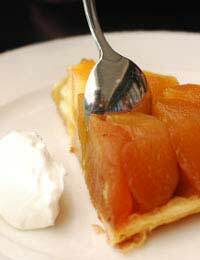 Other alternatives can include apricot tarte tatin and plum tarte tatin.This dish is best served cold with either sugar free crème anglaise, cream or even ice-cream. Tarte tatin often requires a sweet pastry so we suggest using granulated sweetener, but do remember to check the manufacturer’s instructions. You could, of course, make the dish with a savoury pastry. The sweetness of the topping should easily carry the pastry along with it. Preheat your oven to 220 deg C/425 deg F/gas mark seven. Then make your pastry. Take a large bowl and put your soft margarine into it. Using a fork, mash in one tbsp of your flour and a small amount of cold water. Keep adding the flour until you have a smooth paste - adding the water as necessary. Separate your egg and add the yolk. Then stir in your granulated sweetener before slowly adding the rest of your flour. Mix until you have a pastry-like mixture and consistency. Wrap in cling film and place in the fridge to chill. Wash, core and peel your apples. Then cut them into wedges. Squeeze your lemon and pour about half the juice over them. Mix until the segments are completely covered. Place your sugar free jam in a pan and place on a low heat. Stir until melted, remove from the heat and stir in the butter. Take a round 24cm, shallow tin and arrange your apples carefully on the bottom. Pour the liquid jam over the top and bake in the centre of the over for just 10 minutes or so. Meanwhile, take your pastry from the fridge and roll it out on a lightly floured surface. Cut a circle about the same size as your apple tin. Remove the apples from the oven and place your pastry circle over the top, tucking it in carefully around the edges of the tin. Put it back in the over and bake for another 20 minutes or so, or until the pastry is golden brown. Remove from the heat then allow to cool before placing a serving plate over the tin and flipping it over carefully to remove your tarte tatin. Serve with sugar free crème anglaise or fresh cream. Follow the recipe as above but instead of apples, use six large, very firm pears.While you are melting your sugar free jam, place your pear segments in the pan too.As the jam melts, turn the pears over every now and again, allowing the jam to bubble around them.Then tip them into the greased baking tin and follow the recipe as above once again.